Happy April! Happy Spring! Happy Earth Day! In honor of Earth Day on Friday, April 22, an eco chick is being spotlighted this month. Tina Dean Designs are a line of crochets items, from totes to hand warmers to coasters, mostly made from upcycled materials. Plastic shopping bags are processed into strips and made into 'plarn', then crocheted into very durable, fashionable, environmentally friendly products. I especially love that they end up looking like a natural fiber basket, such as raffia. These are *prefect* for the farmers markets that will soon be in full swing. And, going to the beach or the pool, or out in the garden... or any number of places! I am impressed by the creative use of a seemingly useless waste product of shopping- the plastic bags! I can't wait to see what Tina comes up with for cassette tapes! 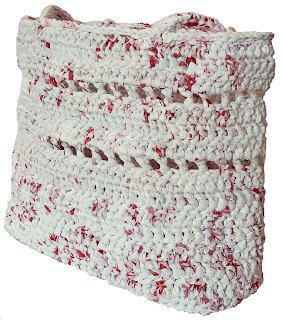 A~I learned to crochet from my grandmother when I was a little girl. I've crocheted on and off for years, and after selling a few of my items, decided to go into business. A~I love the creative outlet it gives me. I had never seen myself as creative, but once I got going, I realized that crochet was not only relaxing for me, but my creativity came alive. A~A great success story is of anyone who feels that they accomplished what they wanted to in this life. A~I owned a women's gym that we had to close due to the economy. Maybe not so much a failure as a learning experience (though it certainly felt like a failure). The knowledge that I cultivated from that experience will serve me well. 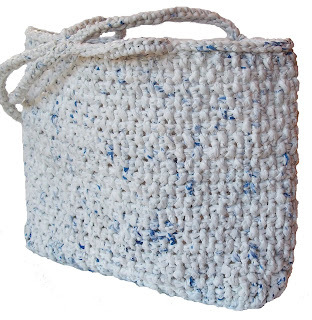 A~My primary focus is the design and creation of my upcycled totes, purses and clutches. I upcycle plastic bags that are the kind that clog up landfills. The average American family of four uses about 1,460 plastic bags per year. My totes typically use over 100 bags each. Making 12-14 tote bags saves what one family uses per year. It's small, but it's a start. Funny thing is, I'm so in tune with plastic bags now, that I want to stop the car and chase down those bags you see floating down the side of the road! What I do is my small contribution to the planet. A~So far, I have items on two different selling venues, but am currently putting my energy into getting my own website completed. I am also now focusing on applying to shows, so if anyone out there has tips and suggestions for me, I'm all ears! A~The joy from seeing someone using an item I've made, and that I can work on a project whenever I feel like it. A~I hate anything with more than two legs that thinks it can live in my house without paying rent. Please note that this does not include standard pets. A~That more people will begin to realize how strong and versatile my totes are, and also recognize that, although the plastic bags are free, there is a lot of time and craftsmanship invested to make them into something beautiful and useful. A~Seeing as I'm a military brat, I could pretty much make a home anywhere. A~Trying to figure out my passion. A~Do you know what this is made of? A~What do you mean? An African or European swallow? You can find Tina Dean Designs in person at the Handmade Mart on Saturday, May 22, in Silver Spring. Tina takes custom orders, so please feel free to contact her through any of the above sites to have something truly special made! Think about how many plastic bags you use on a regular basis. I know I use plenty! They are good for trash can liners, waste bags in the car and for wrapping smelly food from the fridge. However, I also know I could use less.. or just pass them on to Tina! It's terrific to see Tina Dean Designs featured! The quality of her craftsmanship is exceptional. Her works stands head and shoulders above the crowd in a sea of crafters. I admire her because she also doesn't compromise just to make a sale. Truly great to see Tina featured, an oh, I love that red and white plarn bag! I have been looking for the exact content like this. My day seems to be completed now. Now I can think of just one thing and that is commenting as a way of showing gratitude.And yes i have bookmarked your site jenafusion.blogspot.com .